An endearing family adventure, a bitter ecological plea and a rousing action film all rolled into one, Okja proves once more that Bong Joon Ho is a master of twisting something new out of the familiar. While Netflix's gamble screams to be seen on the big screen, this colorful fantasy should be warmly received by global subscribers when it goes live on June 28th. In 2007, the Mirando Corporation, run by the highly eccentric and publicity-crazed Lucy Mirando, sends 26 superpigs to farmers across the world, beginning a ten-year long competition to crown the Best Superpig and bring it back for a celebration in New York. 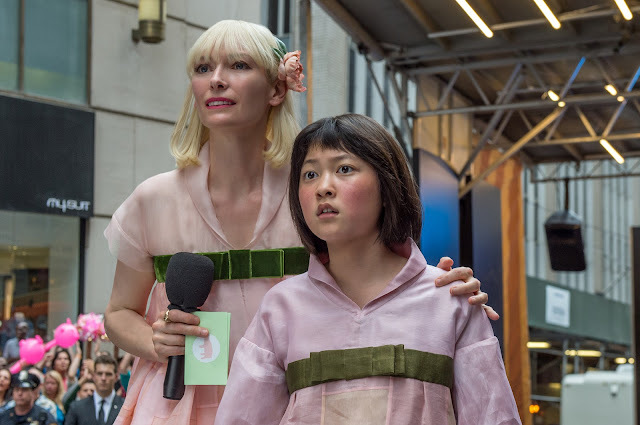 When the time comes, 14-year-old Mija, living high in the mountains in the Gangwon Province of South Korea with her grandfather, is torn from her best friend Okja. Not willing to let her friend go without a fight, she chases after her across the globe and finds herself caught in a struggle between the diehard activists of the Animal Liberation Front (ALF) and the corporate soldiers of Mirando. Ditching the allegory of Snowpiercer, Bong goes for the jugular with a tale that feels all too realistic as a corporation hides its genetically-modified horrors behind PR razzle-dazzle. The fake Mirando sounds awfully similar to Monsanto, and while the Lucy character and her entourage are cartoonish creations, the stark juxtaposition with the realities of their business creates a very unsettling feeling. 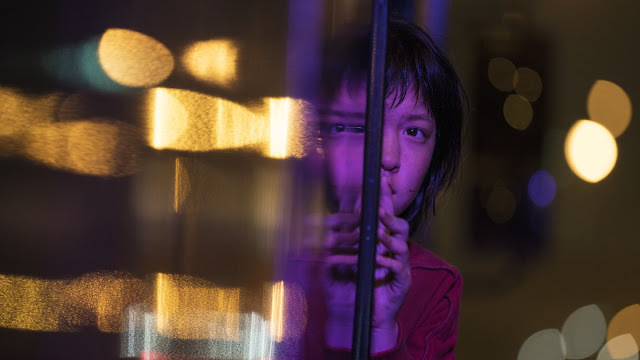 Perhaps the film's crowning achievement is a rip-roaring chase which flings Okja and Mija through the streets, alleys and underground shopping malls of Seoul while adding several new protagonists to the mix. It's a technical marvel and bedazzling escalation of chaos built on clever twists and details which is as funny as it is thrilling. Just as he did 11 years with Ko Ah-sung in The Host, Bong has discovered an incredible new talent in An Seo Hyun, on whose confident shoulders much of the film's expansive emotional heft is placed. 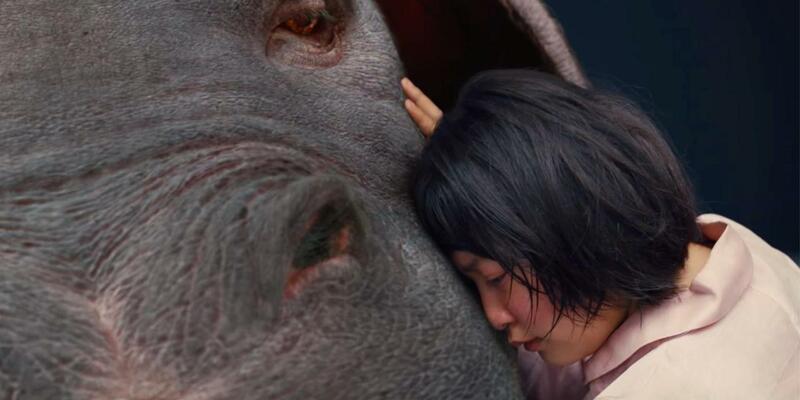 The touching bond she forms with the exquisitely designed CGI Okja launches the film on its poignant trajectory. Given the physicality, levity and tenderness of her performance, An surely has a bright future ahead of her. Tilda Swinton, who is listed as a co-producer, relishes her a role as a vain and paranoid corporate head, while Paul Dano, Steven Yeun and Lily Collins form a wonderful unit as the leaders of the ALF team that tries to save Okja. Jake Gyllenhaal dials it up a notch too high as the Steven Irwin-on-steroids face of Mirando, and Giancarlo Esposito offers a cool and creepy counterpoint to Lucy's egomania. Beyond An, the Korean cast blends seamlessly into this global tale, faring better than Song Kang-ho and Ko Ah-sung did four years ago in Snowpiercer. In his first role in five years, Byun Heebong (the grandfather in The Host) as Mija's guardian gives the film both heart and humor and Yoon Je Moon (the detective in Mother) is suitably conniving and inept as a family-friend/corporate stooge. Yet it's arguably young star Choo Woo Sik who steals the spotlight from them in a handful of scenes as a fed-up truck driver. Much talk will follow about Netflix and the fact that only some people will have a chance to see this in theaters, but it's hard to imagine any other studio giving Director Bong the leeway to craft something that is so ambitious and veers in so many directions at once. What's more it does so with seemingly no regard for age ratings, as expletives are gingerly tossed into scenes of goofy family fun. You may never eat meat again, but Bong Joon Ho and his beautiful Okja have made a grand feast that you'll be able to go back to again and again.